Innovate the Future Challenge Grand Prize Goes to Aerospace Engineering! Dr. Moble Benedict, Assistant Research Scientist in the Dept. of Aerosopace Engineering, is the Grand Prize Winner of the Lockheed Martin 2012 Innovate the Future Challenge for his idea entitled “Revolutionary Vertical Axis Micro Wind Turbine with Dynamic Blade Pitching for Urban Environments.” The Innovate the Future Challenge is a global innovation challenge held by Lockheed Martin as part of its centennial celebration. The goal of this challenge, which is global in participation and scope, is to encourage and nurture innovative technologies that will lead to a secure future for our planet. Ray Johnson, CTO of Lockheed Martin, stated that these “ ideas may help solve important global challenges, encourage the next generation of researchers, and make our communities better places to live and work.” The Grand Prize consists of a $25,000 cash prize, as well as technology incubation services provided by the Maryland Technology Enterprise Institute. Benedict’s entry was selected as one of the fifteen finalists from over 500 entries submitted to the Innovate the Future Challenge. Finalists presented their innovative concepts to an executive review board, which selected the winner based on potential impact of the innovation, its creativity, and the quality of its presentation. Benedict’s winning entry was entitled “Revolutionary Vertical Axis Micro Wind Turbine with Dynamic Blade Pitching for Urban Environments.” This technology involves an efficient small scale (diameter and height of 2 meters, 1–2 kW range), stand-alone, compact, variable-pitch, vertical axis cycloidal wind turbine design. A key advantage, demonstrated via experiment, is that this turbine is self-starting at speeds as low as 3.3 mph (1.5 m/s), can capture energy regardless of fluctuations in wind direction, and is highly efficient even at low tip speed (ratio of tip speed to wind speed). This wind turbine design results from eight years of intensive research in cycloidal-rotor design, development, and testing led by Benedict in the Alfred Gessow Rotorcraft Center. 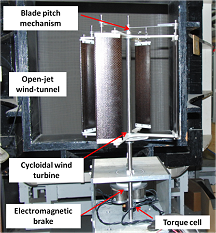 An extensive research program of wind tunnel testing and simulations via computational fluid dynamics clearly shows the potential of this cycloidal wind turbine to maximize energy capture at low wind speeds. Envisioned are applications involving small roof-top farms of such micro wind turbines that could be the solution for efficient wind power generation in urban environments, where energy needs are very high and wind-conditions are extremely unpredictable.